The wild horses of North Carolina’s Outer Banks returned unhurt to the shore after fleeing inland during hurricane Florence, according to a non-profit dedicated to protecting the herd. More than 100 wild horses moved from the beach to higher ground to seek shelter during the storm, according to Jo Langone, chief operating officer of Corolla Wild Horse Fund. Langone said that wild horses instinctively run for shelter when they sense strong winds or approaching storms. Wild horses roam a barrier island near Beaufort, N.C., Sept. 17, 2018. The horses survived on the island during the storm. “Generally, in any storm they tend to, what we term, ‘hunker down,'” Langone explained. Langone said the herd of wild horses has more than 7,000 acres of land to roam. "They can go anywhere from out on the beach area to back behind the dunes where they frequent a lot because there is more food available,” Langone said. Though the Corolla horses are safe, Langone said that she is worried about other groups of wild horses that could be stranded in flood waters. At least one of the southern herds survived unscathed, a government official said. 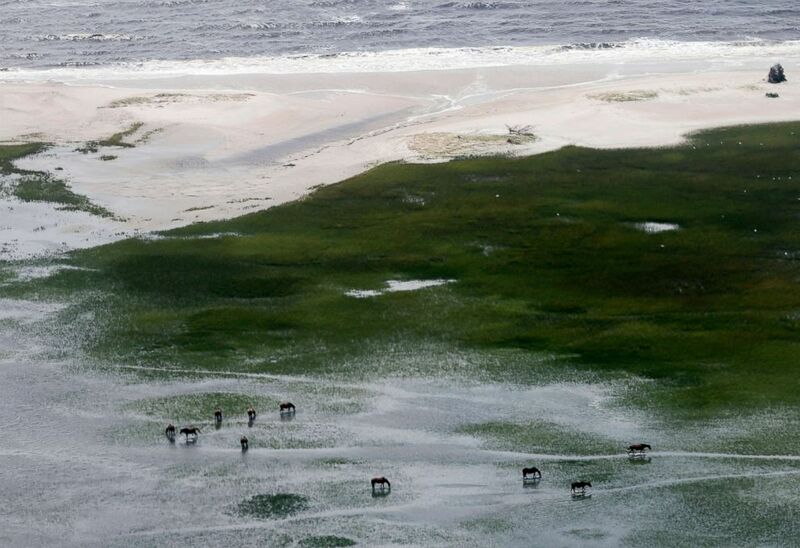 The Ocracoke ponies on Ocracoke Island were all reported safe, according to Mike Barber, a spokesman for the National Parks of Eastern North Carolina.